In YouTube, there is an option called "Watch Later" which you can use with just the click of a button and that particular video will be added to a queue which you can watch later, when you are free.But have you ever wondered if there is a way to bookmark the videos of any Website such as Vimeo, Dailymotion , TED, Facebook, College Humor or even an embedded video on a Blog or a Website? If so, the answer yes.Here is how to do it. The Website is called RadBox. 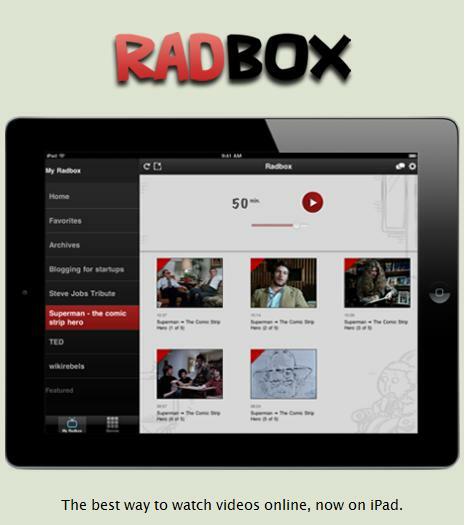 Radbox is a very useful web application that can help you to bookmark any video from any website mentioned above and add them to a list which you can watch at your spare time.Radbox gives you the option of watching the videos online or on an iPad. Unfortunately, the one disadvantage of the Radbox is that it does not seem to support videos from Flickr.